SMART TD’s John Risch, fourth from left. 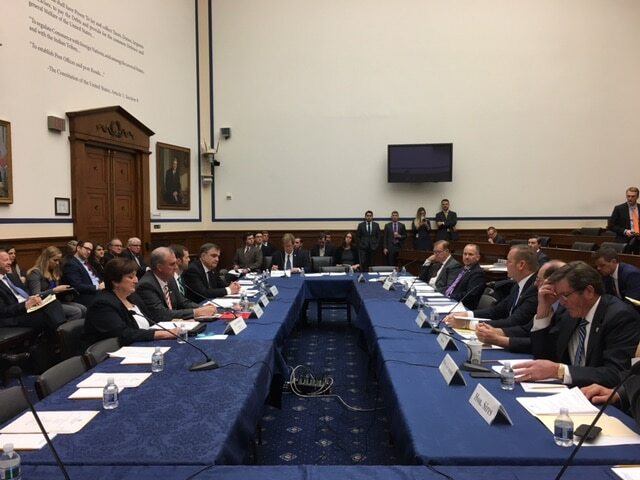 WASHINGTON – John Risch, SMART TD National Legislative Director, participated in hearings as a member of the Roundtable on Emerging Railroad Technologies on March 21, 2017. Discussion focused on new and emerging trends in railroad safety including train crew size, recent advancements in train brake technology, and early warning systems. “Thank you Chairman Schuster, Subcommittee Chair Denham, and Ranking Member Capuano for inviting me to the roundtable discussion on emerging railroad technologies. With nearly 40 years in the railroad industry, I was pleased to have the opportunity to discuss the importance of maintaining minimum crew sizes, implementing Positive Train Control (PTC), and most importantly investing in the installation of Electronic Controlled Pneumatic (ECP) brakes, which are vital to safety of our railroads,” said John Risch, SMART-TD National Legislative Director. “I look forward to working with the members of the committee to improve railroad safety as we discuss opportunities to strengthen our nation’s infrastructure,” Risch continued. Click here to read Risch’s complete notes from the hearing. Click here for information on participants and to view video.